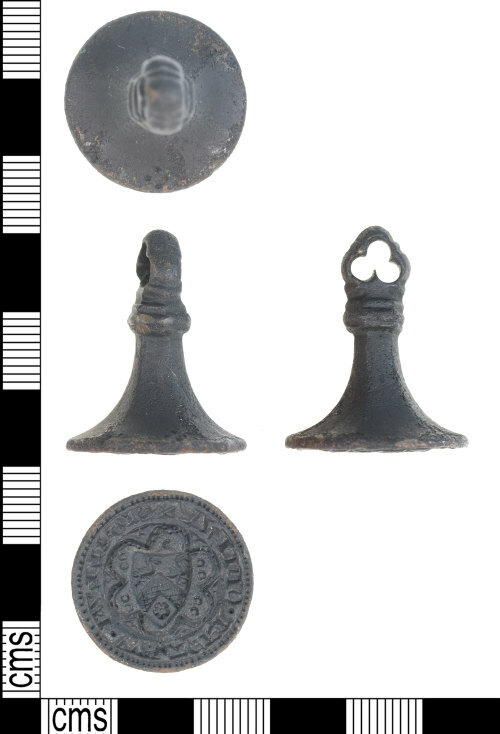 A cast copper-alloy pedestal seal matrix, dating to the 13th/14th century, possibly dating to the period AD c.1340-c.1370. Descriptions: The matrix is conical in shape with a hexagonal die and collar formed from three ridges separating the handle from a drilled trifolate suspension loop. 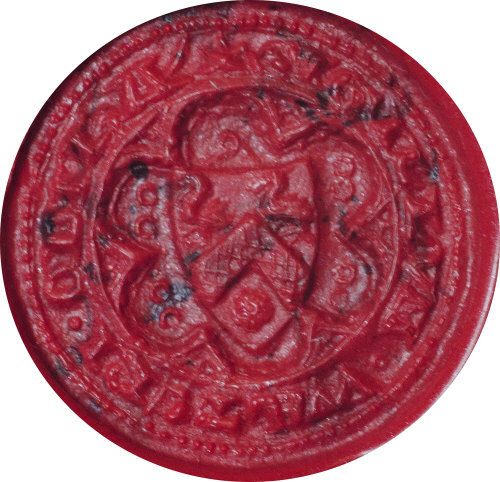 The circular matrix has a heraldic shield of arms device on a square top shield decorated by two birds (top) and a rose? (bottom) divided by a hatched chevron. Heraldically this could be described as 'A chevron (fretty?) between in chief two swans and in base a rose?'. The shield is within a tressure of six arches with two annulets in each arch to the side. The device is surrounded by the inscription "+SIGILLVM.WALTERI.ODIhA' ". Which translates as 'Seal of Walter Odyham'. An orientation mark is present on the top of the die in the form of four etched pellets. The matrix is a very dark grey colour, this colour and also a noticeable weight makes a high lead copper-alloy likely. Measurements: The seal matrix is 30.33mm in height, 24.48mm in diameter (at the die end), 9.57mm wide (at the suspension loop end), 5.28mm thick (at thinnest point at the suspension loop) and weighs 19.22g. Discussion: Small heraldic seal matrices gained popularity at the very end of the 12th century and this pedestal form itself was particularly popular between c. 1250 - c.1400. Dr. Clive Cheesman the Richmond Herald observes that the name and heraldry shown on this matrix can be linked to a seal shown on a tenement grant dated 1360, between a 'Walter De Odyham', Rector of St.John's Walbrook and Richard Sauvage, Rector of St. Michael's Cornhill, both in London. The document is listed in the national archives as E329/31 (E 329). A date in the mid 14th century therefore seems likely.